Chalk Farm lies directly north of Camden Town and just west of Primrose Hill. The neighbourhood offers the perfect balance between the hustle and bustle of inner city London and the relaxed, spaciousness of suburbia - a rare state of living in the capital. 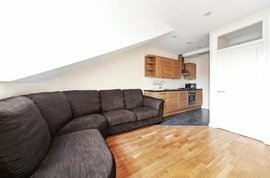 Why not browse our collection of properties in Chalk Farm? Within the space of 10 minutes, Chalk Farm residents can be sampling the sights and smells of Camden’s food markets and lock-side bars or admiring the majestic views atop Primrose Hill. The 'Chalk' in Chalk Farm surprisingly doesn’t refer to the substrate that the area is built on, but is derived from the Anglo-Saxon 'Chaldecot' - the original name of the settlement, which means 'cold cottage' or 'cold shelter'. In the 1770s, the area was a picture of bucolic charm, with horses grazing in open fields beside streams. Chalk Farm started to develop after 1840 when shops and housing were added in Regent's Park Road. The original Chalk Farm farmhouse still survives today as a restaurant. One of the oldest landmarks in the area is the Roundhouse, now a legendary London music venue. It originally housed a locomotive shed with a turntable. Engines would be uncoupled from their trains here, turned on the table and then coupled to an outgoing train. The trains themselves were hauled by cable the rest of the way, as it was not considered possible for locomotives of the day to deal with the gradient. It was completed in 1846 and closed a mere 21 years later, by which time locomotives were too big for the Roundhouse and powerful enough to manage the gradient alone. Chalk Farm residents needn't travel to Camden Town to enjoy a lively leisure scene. Whether you're looking for a refreshing pint in traditional surroundings or a trendy bar with DJs, there is a venue to suit in Chalk Farm. Highlights include The Hawley Arms, the Lock Tavern and Barfly. The area is also home to many restaurants, delis and coffee shops, clustered in and around Chalk Farm underground station. Restaurants include the increasingly well-known Dirty Burger - a gourmet burger house that has seen its popularity soar, as well as Yum Cha, a dim-sum restaurant respected throughout north London. Other dining highlights include The Jam Tree - with its innovative sharing menu - the quirky Belgo Noord and The Hill - which is ideal for al fresco dining in the warmer months. Chalk Farm underground station (Zone 2) is on the Northern line with a 15 minute journey time to Kings Cross and the heart of the West End. Chalk Farm has a fantastic network of bus routes and there are good connections for road users too, with the A41 and the North Circular close by. 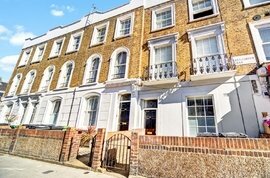 Being situated within the vicinity of such well-known areas such as Camden Town and Primrose Hill, Chalk Farm residents and visitors are never far from something to do, be it a dose of park life or a browse round the many markets. Chalk Farm's streets are lined with a mix of high street chains and independent stores selling everything from coffee to vintage dresses. Also within walking distance are London Zoo, the Jewish Museum and Painted Earth - an interactive art experience for younger children. Just an eight minute walk from Chalk Farm tube station lies the vast green space of Primrose Hill. The hill has a height of 78 metres with spectacular views over London and the perks of a children’s play area and cafés. 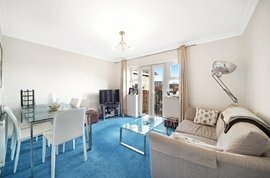 Chalk Farm has some great entry level properties ideal for first-time buyers and buy-to-let investors. 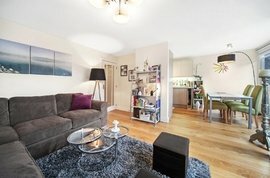 It is not uncommon for studio and one-bedroom flats for sale in Chalk Farm to change hands for less than £400,000 - even those close to public transport connections. In contrast, houses for sale in Chalk Farm are regularly sold for in excess of £1 million. One of the most favoured addresses in NW3 is Eton Hall on Eton College Road - an imposing 1930s purpose-built red brick apartment block, with a porter service. Other notable addresses in Chalk Farm include Herbert Street, Chalk Farm Road, Adelaide Road, Belmont Street and Malden Crescent. In terms of style, Chalk Farm is a mix of Victorian terraces, modern purpose-built apartment blocks, one-off architecturally designed residences and conversion properties.